The Common Boneset is a hive of activity right now. Wasps especially are attracted to the white flowers. I counted seven Northern Paper Wasps on one plant yesterday. This Sand Wasp (Bicyrtes sp.) 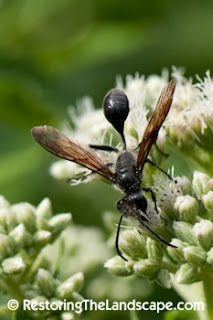 is also most often spotted on Common Boneset. This wasp preys upon true bugs (ex. Shield Bugs). 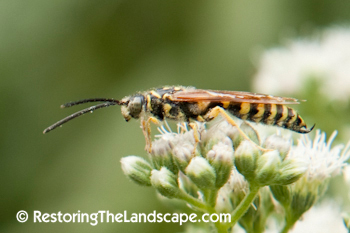 The distinctively shaped Potter Wasp (Eumenes sp.) 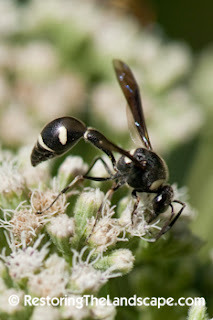 also likes Common Boneset. 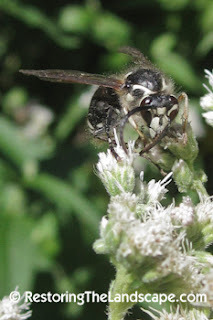 Bald Faced Hornets (Dolichovespula maculata) have been difficult to photograph due to their fast, erratic flight but are regularly visiting Boneset flowers. This photo was taken a couple of years ago. 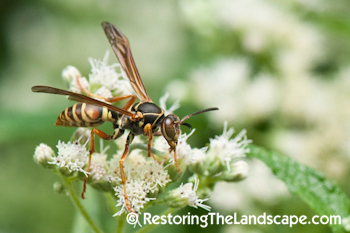 Wasps play an important role in the wildlife garden, keeping populations of plant damaging insects down and providing a balanced food web. 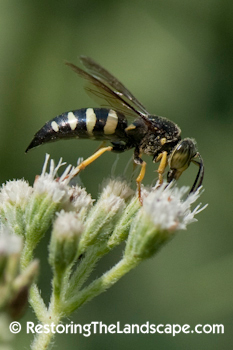 Wasps are not aggressive when visiting flowers for nectar. Stop and take a closer look at them and appreciate their unique forms and colorations.